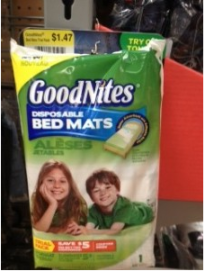 FREE GoodNites Disposable Bed Mats + Overage at Walmart! Hurry and print this coupon to not only score free bed mats at Walmart, but get some overage too! Final price is FREE + $0.53 in overage! TIP: Look for these hanging near the diaper/baby section.